2. Twenty-two years later, all most to the date, on April 14th, 1870 the cry of fire once again rang throughout our village. It is believed that the fire started in an old wooden building occupied as a barber shop and home to several families, and was located in the center of the business part of town. As we still had no fire department, the village relied on the members of the community to supply buckets and ladders to combat the blaze. When the smoke cleared, Medina had lost over twenty buildings on the square totalng $200,000.00. in damages. 1. June 1871 – Council decided to levy a tax of $1,000 for corporation purposes and one of five-tenths of a mill for road purposes. However, by a vote of 3 to 2 it decided against the purchase of a fire engine. 1. It took two great fires, those of 1848 and 1870, to convince the people of Medina that a fire department was necessary and there was nothing more than a Hook and Ladder Company and a bucket brigade. 2. It was not until after the Empire Block fire of 1877 that Council, under great pressure from the community, finally approved the beginning of a fire department and purchasing of much needed fire equipment. 3. The citizens of Medina were so excited to finally receive a Hook and Ladder Company in 1877 that they presented Medina's first Fire Chief, Ephram E. Brenner and his assistants with a nickel plated trumpet. 3. Samuel Andrews Jr was hired to build a hose carriage for the use of the Fire Department in 1880. Fire Engine Company: Foreman, W. O. Sanders; 1st Asst., H. H. Brainard; 2nd Asst., H. O. Wood; Secretary, L. S. Smith; Treasurer, Orlin Oatman; Engineer, John Barnes; 1st Asst., D. A. Wells; 2nd Asst., W. H. Hickox; Firemen: L. S. Smith; Fireman: Charles McClure. Foreman, John Warner; 1st. Asst., William Frazier; 2nd. Asst., Lyman Oatman; Treasurer, John Renz; Secretary, Charles Hobart; Top Ladder Men, William Levet; William Greenip; P. O. Hays; Elisha Beedle; Charles Hard; Lyman Oatman; Charles Boughton; Foot Ladder Men: Jesse Fiegle; William Harpley; William Frazier; Charles Hobart; John Renz; M. Hill; August Blessing; Herbert Bradway; Pump Men: Joseph Hill; J. Frazier. Reserve Men: B. F. Hobart; Martin Brogan; Albert Herkner; Clay Hills; Gene Rounds; Simon Oatman; R. R. Rettig; A. Tebet; F. R. Mantz; T. Metzger; Frank Hill; Frank Handy. 1874 - "On Tuesday night a fire was discovered in the cellar of Empire Block under the store of E. J. Kern. The alarm was sounded and the bucket brigade was on hand, forming a line to the public cistern at the north-west corner of the square, and the fire was extinguished before it got under much headway. 1877 - ''The fire friend again visited Medina, destroying four large buildings. It started in the third story of the Empire block, and it was not possible to reach it until it was so far under headway that it was entirely unmanageable. The American House, just across the street, was saved only by the hardest work. The buildings burned were the Empire Block and a frame building also adjoining it, both owned by Mr.Bronson, who had $4,000 in insurance on them; a three story frame building owned by M. Bach valued at $2,000. The last building burned was owned by Cleveland parties with no insurance. 3. The Silby Fire Engine, May 11, 1877 --The legislature passed the bill to authorizing the village of Medina to purchase a fire engine. If one is purchased the Council must issue bonds, from the sale of which the money to buy the engine can be raised. But an engine without a supply of water will be useless. At least ten public cisterns should be built at once; one at the southeast corner of the square, and others at convenient distances on the main streets. These will cost much money, but they will be absolute necessary. So the Council must include all the items of expense when the estimate of cost is made up. 4. An engine house, also will be needed, unless it is intended to let "der machine" lie around loose. When the matter gets in shape ready for action, we suggest that the property owners of the village—the people who will have to pay for the improvement—be consulted by the Council, and their instructions followed in the purchase of an engine that will be the most serviceable, under all the circumstances, and that no false ideas of economy permitted to prevail whereby efficiencies shall be sacrificed for the sale of cheapness. A garden syringe is of about as much service at a fire as the ordinary hand fire-engine. If we get any let us hare a first-class machine—no second hand affair such as the larger towns and cities have discarded and which are for sale cheap because they are worthless. 5. Finally in 1877, a $3,000 bond issue was passed and Medina bought a “Number 4 Silsby Steam Fire Engine” which was a wagon pulled by horses along with 500 feet of rubber hose. This fire engine had a pumping capacity of 425 gallons of water per minute. 6. From 1877 to 1919 the old Silsby fire engine that was horse-drawn was the pride and joy of the community. The 42- year span is a long life for any mechanical apparatus but the Medina Fire Department gave it constant repair and attention to make it last. In the Medina Fire Department's ever-present fight to be in action in the shortest possible time, they added their ingenuity as modern times gave them new opportunities in firefighting. 8. The boys had it fixed up so that as the equipment dashed out of the engine house the rubber hose automatically snapped off the connection and away they went with new portable fires on her grates. This meant that pressure was available immediately for firefighting. A man was always left in the engine house to turn off the gas after the equipment had gone. 9. The horses that drew the old Silsby No. 4 had come from Dan Wells and Grover Yocum by special rental agreement with the village council. As time wore on this did not work out satisfactorily, so Street Commissioner Herbert Needham was empowered to purchase two good, fast and stout horses to be stabled near the present Cannon Grocery Store on South Court Street. This location did not prove satisfactory as this was the location of the main trading area of Medina Village at the turn of the century. The traffic of parked horse-drawn rigs was so dense that it was difficult to get the horses out of the stable and over to the fire department. Whereupon, in order to save time when answering an alarm, the team was moved to a stable in back of the county jail. 10. In 1878, the village purchased the lot of W. O. Sanders for $400 to build Town Hall and Engine House that was 24’ x 60’ feet with two brick stories, east of Phoenix block adjoining the lots of S. H. Bradley and Son and Munson Hardware on the south side of the square. 11. The brick work at New Town Hall and O. N. Leach’s Store was completed in 1878. 12. Builder, George F. Gruninger’s obituary says it was first Engine House he built. The building will have a Tower and calaboose for vagrants and prisoners. 13. Clark and Munger quoted materials for the job at $3000. Mr. Tilley bid was lowest bidder, but the village officials didn’t want him to build it! 14. The new 608 pound Engine House bell was manufactured by Buckeye Bell Works of Cincinnati for $141.75 was delivered in 1878. Only the bell clapper will swing and the bell is easily rung with 2 ropes for fire alarm, and meetings. 1. In 1881, a group of young lads set John Steeb's barn on tire while smoking corn-silk cigarettes. Neighbors arrived first with their buckets and begin the traditional brigade. By the time the fire department arrived, the fire was out. It was good thing because that cistern was dry as well. Ephraim Brenner was the department’s chief engineer at the time. His men worked valiantly, but the system was new and inadequate. 2. In 1882, Medina council voted to invest in a water works to provide water for homes and to insure there would be water in the village cisterns. When Foltz’s saloon caught fire near the American House Hotel the department was there in eight minutes and put out the fire with water from the new water works. 1. In 1886, William Squire Frazier and the City Marshal’s office was in the Engine House. 2. The next fire equipment purchased by Medina was a small hand-drawn chemical wagon on large wooden wheels with steel hoops, but it was doomed to early destruction! Back in the olden days, the Cleveland-Southwestern interurban street car tracks came along North Court St. and turned at the present Standard Drug corner and continued down West Liberty as far as Bowman's and then turned southward. 3. The firemen, in answering a call one day, met the street car making a turn at the Standard Drug corner. The motorman upon learning of the fire down West Liberty Street stopped the street car and the boys had the bright idea of connecting it to the street car and away they went. The only trouble that developed was that the large wheels were not quite the same width as those of the street car track and in full speed, got caught in the tracks, whereupon there were large splintering reports and one Medina chemical wagon was strewn over half a block before the street car was stopped. That was the end of the number one addition to the fire department, after the purchase of the steam engine. The Medina Volunteer Fire Department has had not only a most glorious record in the past, but has an outstanding record for the present. 4. In 1886, A I. Root's warehouse and stables on the south side of his factory caught on fire. Root was ahead of his times and had a good water supply on hand, Fire fighters could not save the buildings, loaded with dry timber, but they doused Root's main factory buildings, the train depot, and B. H. Wood's warehouse across the street and stopped the fire in its tracks. Still, Root lost thousands of dollars in inventory: S2.00O in beeswax 800 beehives, and 60.000 feet of lumber. Root thanked the fire department for their work. 5. Each year the volunteers elected their officers for the two companies—the Engine Company and the Hook and Ladder team. After twelve years as Chief, Ephraim Brenner declined the office. C. O. McDowell served as captain of the leading hose, and John Esgate headed up the suction hose team in 1886. 6. In 1886, Village Council borrowed $500 for a new fire hose and built a tower on the south side of the engine house to suspend the hose for drying. Council also paid T. H. Johnson of Holbein’s Wagon Shop to build a mud boat for the steam engine so it could be pulled to any location regardless of road conditions. The idea sounded good, but the first time they used the boat, it sunk deep into the mud with the heavy engine securely on top. It took a six-horse team to pull the equipment from the mire. 1. William D. Frasier, son of Squire Frasier, former Town Marshall (1886) replaced Andrew A. Foskett as Fire Chief in 1898 and served in that capacity until being replaced by Samuel G. Foote in 1903. 2. William D. “Bill” Frazier was a famous athlete and hunter. In his youth he once out-ran a horse from Medina to Sharon and the horse dropped dead half-ways there. 3. It was said in his obituary that Frazier also repeatedly caught foxes with his bare hands, after out-running them in cross-country chases. 1. View of the Town Hall and Fire House and South side of the Public Square in 1914. 1. In 1916, Village Council approved the purchase of the Hallock Motorized Chemical Fire Engine manufactured by Hallock Engineering of Medina. 2. On August 18, the Hallock Engineering Company had completed and made delivery of two of the motor chemical trucks which it was building at its local factory. The first outfit was delivered to the Medina Fire Department on Tuesday and on Thursday delivery another truck was made by Tom P. and M. O. Hallock to Tippecanoe City in Miami County. Hallock chemical trucks are now in use in numerous cities, towns and villages throughout the United States and the careful and conscientious workmanship of the local builders is winning new orders at a pleasing rate. 3. May 12, 1916 - Subscribers to the fund for the Hallock Motor Chemical truck for the Medina Fire Department are requested to pay their subscriptions by May 10th to S. H. Brainard, chairman or to Mrs. Wesley Bartholomew, who is collecting for the department. 4. There is still about $125 to raise out of the $1,200 needed to pay for the Hallock Chemical engine which has been ordered for the fire department. 5. June 23, 1916 - All Scribers to the fund for the new motor chemical truck for the fire department are requested to pay their subscriptions just as soon as possible, as the truck will be delivered shortly and payment will have to be made upon delivery. Let everyone who has not paid urge the fireman. 1. The I. O. O. F, block on north side of the square was partially destroyed by fire on Wednesday morning. The building is a concrete block and brick structure and is owned by Morning Star lodge No. 261, I. O. O. F.The third floor was occupied by the lodge room proper, with a well-appointed dining room occupying the rear or north half of the second floor. The front half of the second floor is occupied by the offices of the Medina Telephone Company, while the ground floors contained the grocery store of D. R. Pelton on the west side and C. C. Cheney and Son's auto sales room on the east side. The roof of the entire block was practically all burned and of the third story of the building there is nothing left, but the four walls and the floor. The two lower stories were not damaged to any extent by the fire, but were flooded with water and somewhat damaged by smoke. The building was well covered by fire insurance. 2. The Medina Fire Department responded quickly and the new chemical engine which is provided with 200 feet of hose, was given its first real test, but the fire had gained considerable headway and could not be extinguished by that alone though it held it somewhat in check, while the steamer was being fired up to a working head of steam. Some difficulty was had by bursting hose, there being, numerous leaks In the line from the east side of the park. 3. The A. I. Root Company came to the rescue with two reels of hose, a very much needed addition to the present city equipment. The firemen worked like heroes and made a splendid fight, a very practical demonstration of the wisdom of Medina's maintaining a fire department and also of giving the department better equipment with which to fight. For instance, ladders that can be quickly adjusted to reach the third floor of a building. 1. Friday, March 7, 1919 - The new village 1918 American-LaFrance type 75 fire engine arrived In town on Wednesday last and has been thoroughly tested and has met all the requirements and specifications and now only awaits the acceptance by council to become the property of the village and be put in service. R. Reinhardt, D. Steingass, J. Lamphear, S. Brainard, F. Rollins, Doc. Wise, H. Grunniger, G. Wilder A. Whitney C. Chappen, G. Van, E. Wheeler, H. Greisinger, F. Pelton, W. Washburn, C. Wolfe, C. Wideman, A. Bash, A. Shaffer. 2. The engine is both a handsome and powerful looking machine and has been favorably commented upon by all who have looked upon and examined It will give the town fire protection that is unexcelled by any small town in the country and that will not only keep the fire insurance rates from being elevated, as was threatened, but It is expected will them down. 3. On Tuesday the engine was taken to the river and threw 803 gallons on the minute, as against the 750 gallons of the specifications. On Wednesday it was given the official tests before members of the council and fire department. This took place at the cistern opposite the court house. Then it threw a single stream of 813 gallons to the minute a distance of fully 250 feet and with a pressure of 540 pounds, whereas 120 pounds is all required in the specifications. It night be said that the present pump of the water works can pump only 350 gallons into the stand pipe, while the new one will be able to pump but 750 gallons. 4. The “mud test" was then given and on the worst street undoubtedly in town, North Huntington. The engine took to the mud there like a duck to the water. It had not gone far, however, before a key in the sprocket gear broke. This was replaced and the engine plowed through a foot of mud on Huntington and Friendship Streets and came out on North Court Street triumphantly, at good speed and without stalling in the least. When the test started there were 22 men on the engine, or an additional weight of nearly two tons, while after the accident nine men were carried, the others having: got tired of the delay and gone. 5. The contract price for the engine is $10,500. The horsepower of the motor is 105 capable of driving; the machine at 75 miles an hour, though it is now geared to only 50. It is equipped to throw three streams of water, but a fourth can be added, with this number of streams an inch and an eighth nozzle are used, whereas the nozzle used on the one stream this week was an inch and three-quarters. It also contains a chemical engine of 40 gallons capacity. The 500 feet of new hose recently ordered by council also arrived this week. 6. As the American-LaFrance engine aged while in years of service it was called “Old Asthma” due to the bellows of smoke that erupted from its engine. 1. In 1920, a new siren on the fire department truck is run by a 25-cycle motor. The new siren is a failure! It sounds like the dismal song of a lost soul and cannot be heard 200 feet. The windings of the motor may not be adaptive to the 25-cycle current used in the Medina Village. 1. The Medina Fire Department took delivery of their fourth fire engine, a Prospect “Deluge”, type 35-Special Master Fire Fighter Model MS truck for a cost of $5,420 on May 7, 1925. 2. The ladders and truck purchased last week for the use by the Medina Fire Department have arrived and are housed in the engine house. Everyone is highly pleased with the new equipment which was so badly needed. The extension ladder was tried out on the Phoenix block, the highest business building in town and reached 10 feet above the cornice. Council, at its meeting Tuesday night, presented the old, worthless truck to the boy scouts. 1. In 1926, Shuyler Hoff and Harry Reutter have remolded the entrance to the fire department station. 2. In 1926, the groundwork for building codes was presented to village council by the Medina Fire Department as a result of the department’s study of conditions in the village. 3. Firemen Association Officers for the coming year 1927 were Albert Pretter, president; Gardner Wilder, secretary; Ralph Reinhart, treasurer; Dr. William F. Wise, chief and Henry Gruninger, Enos Wheeler and Gardner Wilder as assistant chiefs. 2. Lodgings were provided at the Town Hall and Fire House; In 5 months of 1931, there were 1000 meals served and 615 men given lodging during the depression period. (April 30, 1931 Sentinel, page 12). 3. In December, 1931, Henry Gruninger, acting chief of the fire department, passed away as the result of injuries suffered in a fall inside a huge concrete tank of the new sewage disposal plant Monday afternoon of last week. 4. Gruninger’s death marked the passing of two Medina fire chiefs within seven weeks, Dr. William F. Wise having died Oct. 14. 1931. Gruninger, first assistant chief, had been elected by the firemen to become chief and appointment by Mayor John R. Moore and confirmation by the village council having been set for the next regular meeting, Dec. 15, 1931. Standing L/R: Stow White, Walter Everhardt, Albert Whitney, Henry Greisinger, Clyde Chappen, Sam Brainard, Ward Washburn, Floyd Pelton, Ralph Reinhardt, Dan Steingass, Clyde Wideman, Doc Wise. 1. In 1941, a one piece new door was installed on Fire Engine House and will swing up and overhead. 1. In 1945, a one-story, 18’ x 22’ feet tile addition was added to the rear of the engine house for two Jail cells at a cost of $2000. 2. In 1947, the fire department purchased a 1946 American LaFrance, Enclosed 750 GPM Pumper fire engine for only $15,000. 1. John W. Brown was business proprietor, Mayor and served on the Medina Volunteer Fire Department. 2. This picture was taken of John Brown when he became the 58th Governor of Ohio after he served as a World War two veteran, also served as Medina mayor from 1950-1953. John died in Medina in 1993, he was 79 years old. This picture can be found on his tombstone in Medina at Spring Grove Cemetery on East Liberty Street. 1. In 1961, the City purchased an International Pumper. 3. On December 31, 1965 Fred Hazen retired from the Volunteer Fire Department after twenty-five years in the volunteer company and five years as chief. He was succeeded by Thurston Berry. 4. In 1965, Other officers and members of the Medina Volunteer Fire Department are: Horace Williams, assistant fire chief; Cloyd Arbogast, second assistant chief; Donald Bachman, Dudley Bagley, John Brown, Leland Codding, Otis Crank, George Fields, Fred Greenwood, Lloyd Hanshue, Wilbur Hertel, William Hogue, Larry Kennedy, Wilbur Kerch, Charles Lamphear, Corwin Letterly, Jack Miller, Richard Myers, Robert Norton, Calvin Papp, Adrian Rooy, Philip Scherer, David Thomas, Ray Thomas, Ray Wagner and Howell Yates. 1. The Fire Department now has three pieces of fire-fighting equipment; a 1946 American LaFrance fire engine and two International pumpers. 2. In 1966, the Fire Department has answered forty-six calls within the City and fifty-five within the Township. 3. In 1967, a Snorkel Fire Truck was purchased for the Medina Fire Department. 4. In 1970 the citizens saw a town worth saving and in 1970, Medina's own Community Design Committee (CDC), decided the first Engine House and Town Hall was worth saving, so the City repainted and redecorated it to show its former glory when it was first built In 1878. 5. In 1971, the Medina Fire Department acquired an American LaFrance Pumper Engine. 1. In 1981, the Medina Fire Department acquired a Seagrave 1000 GPM Pumper Engine. 1. In May 1987, at a general election in the City of Medina the majority of voters approved the issuing of bonds in the amount of $2,853,000 for the construction and equipping a main fire station and two satellite fire stations and rehabilitating the existing fire station on Public Square. 2. Station 2 is located at 500 Lake Road and was built in 1989. This firehouse is strategically positioned to cover the industrial district of Medina, due to the fact that many of the factories there use large quantities of hazardous chemicals and flammable materials. 3. Station 2 houses several pieces of apparatus, including Ladder-2, Engine-5, and Utility-2. Also located at this house is a historic pumper that is used for parades and other community events. It is a 1946 American LaFrance. 1. Station 3 is located at 1000 Wadsworth Road and was built in 1990. It has a watch room, a training/meeting room and an apparatus bay. Station 3 houses our newest truck, a 2015 quint-pumper with a 75 foot aerial ladder, Engine-3. Also located at this firehouse is the Heavy Rescue truck, Rescue-3 and our Brush Fire truck, Utility-3. 2. In May, 1991, the City of Medina acquired city lot 4289 comprising 2.5 acres at the corner of North Huntington Street and Reagan Parkway for the proposed new main fire station. 3. In October, 1991 Medina City Council authorized the Mayor to advertise for bids and contract for the construction of a main fire station according with the plans and specifications by the architect. 5. In 2017, Station 1 houses several pieces of apparatus, including Ladder-1, Engine-1, Car-3, Utility-1, a boat, an incident support trailer and an LST Ambulance. 1. The Medina Town Hall and Engine House Museum opened in November, 2013 and is housed in the historic 1878 Town Hall and Engine House building at 50 Public Square, on the south side of Public Square. The bright red building is one of the city's iconic landmarks. 2. The museum chronicles Medina's history, starting with its first settler in 1817. The collection showcases the city's transition from a small farming community and rural county seat to the bustling city it is today. 3. Visitors can view early photographs of the village, a large mural depicting the great fire of 1870, photos of the subsequent reconstruction between 1871 and 1890, and the modern architecture and neon signs of the 1940s and 1950s. 4. Photos and memorabilia from the comprehensive Historic District restoration that began in 1968 are also on display. 5. The museum is also home to a 1918 American LaFrance fire engine, the High's Jewelers clock sign, fire and safety memorabilia, and many other artifacts. 6. The collection will continue to grow and evolve as more and more people are aware of it, and as they donate materials to more fully showcase the rich history of Medina. 7. The museum is owned by the city and run by the Medina Archives Commission. It is open during special events on the square and by appointment. Admission is free. 8. New video monitors were also installed, which will display slideshows with historical photos and the short film “Hometown USA” on a loop, which was a World War II-era film for American servicemen overseas that promoted the positive attributes of small town life in the U.S. at that time. 1. As early as 1835 the little settlement around the Public Square area of Medina in Medina Township, which also extended southward down into Montville Township south of Smith Road, was incorporated into the Village of Medina by a special act of the State Legislature, as the law then required. Because all of the village records were destroyed in the Great Fire of 1870, no historical background about its incorporation, or any of the names of its first officials, including that of the first mayor, were obtainable. For this same reason the list of the names of the mayors of Medina given below begins of necessity with the year 1870. 1. At a special meeting of the Medina Fire Department on Saturday evening, Nov. 15th, it was decided to dedicate the new Town Hall and Engine House with appropriate exercises on Thanksgiving Day, Nov. 23th, 1878, and Chief Engineer Brenner appointed the following General Committee to make arrangements for the same: O, M. Jackson, John Bradley and William Frazier. Chief Brenner was instructed to confer with the Council and get their consent. The Mayor and Council were invited to attend as special guests of the Fire Department. 1. Medina Band. 2. Mayor and Council. 3. Visiting Firemen. 4. Speakers. 5. Chief and Assistants. 6. Engine Company. 7. Hose Company. 8. Hook and Ladder Company. 9. Sporting Company. 10. Juvenile Companies. place at the Engine House after the parade. The ladies are making arrangements for a supper for the benefit of the Fire Department, in the New Town Hall, in the evening, from 8 to 11 o'clock. Outsiders will be charged 25 cents. 1. Therefore prior to 1950 Medina was governed under a "statutory village" form of government. Under this form, the village officials included a mayor, clerk, and solicitor, all of whom were elected by popular vote for two-year terms. The village also had a town council, the members of which were elected for terms of four years. A public affairs board, which managed city-owned utilities and a marshal, were appointed by the mayor, with the approval of the council. 2. The time between 1951 and 1954 was one of significant governmental changes for Medina. Because the 1950 census showed Medina to have a population in excess of 5.000, it was possible for the village to become a city at that time. 3. In October of 1951, the village was notified by the Stale that it would be classified as a "statutory city," effective as of January 1. 1952. The changes brought with this different form of government were as follows: The offices of treasurer and auditor were created, the former to be elected for a two-year term, the latter for a four year term. Also created were the offices of director, safety director, and chief of police. All three of these officials were to be appointed by the mayor. 4. In the May elections of 1952, the people of Medina approved a charter to become effective as of January 1, 1954. This is the form of government under which the City of Medina now operates. 1. When Medina was a village, the “arm of the law” was the town marshal that was appointed by the Village Council. 2. Any town marshal can appoint any number of unpaid deputy town marshals or reserve officers who may exercise full police powers in the state. The marshal is described as "the chief police officer of the town and has the powers of other law enforcement officers in executing the orders of the legislative body and enforcing laws. 3. A Night Watchman was hired by the village proprietors to over-see their properties after they closed for the evening. Some proprietors allowed the Night Watchman to have access to their stores when closed. 2. William D. Frasier, former Town Marshal (1886) replaced Andrew A. Foskett as Fire Chief in 1898 and served in that capacity until being replaced by Samuel G. Foote in 1903. 3. William D. “Bill” Frazier was a famous athlete and hunter. In his youth he once out ran a horse from Medina to Sharon and the horse dropped dead half-ways there. 4. It was said in his obituary that he also repeatedly caught foxes with his bare hands, after out-running them in cross-country chases. 5. The law enforcement facilities of the community, including the two-cell town 'lock-up” have been housed at 50 Public Square, in the old Town Hall structure since it was built in 1878, sharing quarters there with the Fire Department. Upon special arrangement the city also occasionally uses cells in the new Medina County Jail. 1. Franklin T. Burnham night watchman 1906-1908, farmer 1868-1888, then, moved to Medina where he was clerk in various businesses, a member of village council, and Town Marshal. 1. Van Brown Maple, night watchman, born 1854, died 1914. 1. William Adams ‘Will’ Lowe, night watchman, 1910-1912. Was later with highway department; died in 1932. 1. Henry M. Blakeslee, Town Marshal, 1913-1916; born in Weymouth in 1871 and he moved to Medina in 1906. 2. In 1916, he shot and killed night watchman John H. Gates after a quarrel; tried to commit suicide; went to prison. He died in 1921. 1. On April 18, 1916, Medina Village Watchman, John Gates, 60 years old, went to work like he did so many other nights, fulfilling his obligation to make sure the businesses in village were secure. At some point during his rounds and during the “deserted hours of the morning” Gates apparently sat down to rest on a ledge in front of E. P. Hartman’s Grocery Store facing the historic square in Medina. 2. It was at this point that Gates was approached by Henry Blakeslee, the 48 year old village marshal, a position in which Gates had previously served. Blakeslee, who was in possession of a 16 gauge double barreled shotgun, apparently had ongoing issues with Gates. Seconds after the initial meeting, two shots rang out in quick succession. A couple staying in a local hotel looked out in time to see the assailant running away from the spot where Gates was later found lying dead. 3. A search to find Blakeslee regarding the incident was fruitless. However, Blakeslee’s discarded uniform coat was found in the basement of a nearby clothing store. It contained two live shotgun shells that were identical to two empty casings found at the scene. 4. After an exhaustive 8-hour search, Blakeslee was found hiding in a hay maw in his neighbor’s barn. Blakeslee had a self-inflicted gunshot wound. Although seriously injured, he was treated and eventually recovered from those wounds. His shotgun was found under the neighbor’s couch. Henry Blakeslee’s case was subsequently presented to a grand jury who indicted him on first degree murder charges. He was tried and found guilty of manslaughter and received a sentence of one to twenty years. 5. Night Watchman John Gates served with the agency for eight years. He was survived by his wife Katie and four children. 6. John Gates is the only peace officer die in the “line of duty” in the 200 year history of Medina Village and City as of 2018. 1. Albert L “Al” Sedgwick became a night watchman when John Gates was killed in 1916. He was born in Weymouth in1864; he worked for King Bridge Company; he owned Medina Coal; was a barber; owned a pool room in 1925; also owned a restaurant and a meat market; was Medina village street commissioner from 1914-1929. Was a commercial photographer in the old Arcade Building; he sold vacuum suction cleaners in 1909; died in 1950. Here are the two new guardians of the public peace in Medina village, in their new uniforms—Al Sedgwick and Al Hange. And it may be truthfully said that there is no village anywhere around that can boast of more popular and more efficient officers. Sedgwick is night watchman and deputy marshal, and Hange is merchants night watchman and deputy marshal. 1. Allen “Allie” F. Hange was a liveryman at American House Hotel; bought and sold horses for the government during WW I. 2. In 1916, he “filled in a few days” as a favor to the mayor Lewis Randall, but stayed several decades. .
3. September 20, 1918, a big shepherd dog belonging to John Tanner of North Court Street ran amuck Saturday afternoon and was killed by Marshal Hange after it had bitten three different persons. Early in the day it bit one of Tanner's children, but not seriously. Uptown it waded into a soft cement walk on West Liberty Street and received a wallop on the head in payment it was then that the dog started out in earnest. 4. Hange was also a truant officer for many years and Town Marshal from 1929 to 1946. 1. Stowe White was Night Watchman from 1920-1924; Sawyer at A. I. Root; carpenter; custodian at Masonic Hall; Medina Farmer’s Exchange custodian in 1924. In 1916-1918 taxi service runs automobile livery service between Medina and Wadsworth from American House Hotel via Seville; two round trips per day for $1.20 per round trip; takes 1 hour in 1915. 1. The Police Department and Its activities have grown rapidly since the early 1940's, when it had only two men as regular law officers, Allie Hange and Louis Benford. 2. in 1916, he “filled in a few days” as a favor to the mayor Lewis Randall, but stayed for thirty years from 1916 to 1946. Mr. A. F. Hange was marshal for the longest term in the history of the village. 3. In 1942, Medina Village Council authorized a secondary police station location at the corner of South Court and East Liberty Streets in a small booth with only a telephone for communication. The police booth remained until 1948.
, 1. Elmer E. Holtzburg, pioneer settler to Oklahoma territory; built AC&Y RR in Medina; he worked at Goodrich in Akron; owned a farm between Granger and Hinckley in 1904; moved to Medina in 1924; night watchman 1926-1940; died in 1942. 1. Louis Benford was a formerly a rig builder and carpenter. Benford began in 1938 under veteran Town Marshall, Allie Hange and served through the WWII years. 2. Benford was appointed Town Marshall in 1946, but was relieved of that post in the political hassles of 1948-1949, a period which saw three Town Marshals in three years – Benford, Clair House and Edward Wells and finally Homer Davis, Sr. Benford died in 1972. 1. House became a deputy sheriff in 1929 under the late sheriff, Lyman Buffington his father-in-law. 2. House was Village policeman from 1935 to 1951, then retired and ran House’s Flower Shop. 3. Clare F. House died 1955 in a fall from scaffolding at his Lafayette farm at the age of 54. 1. 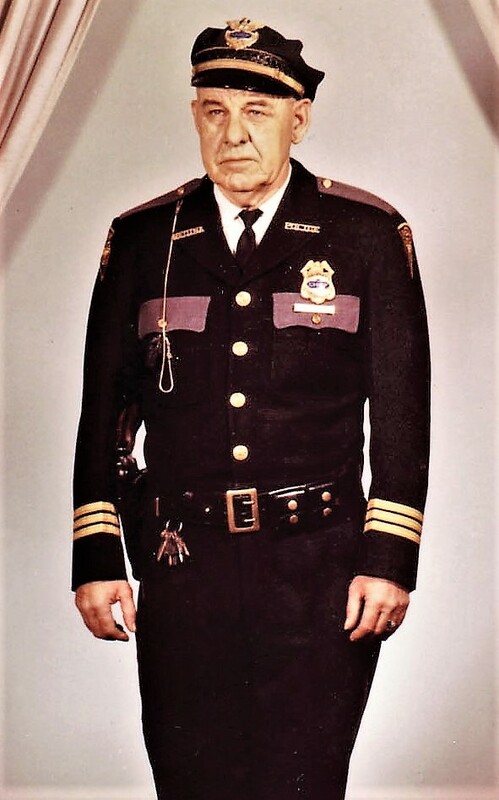 In 1952, Homer Davis title of Town Marshal was changed to Chief of Police, when Medina was officially designated a “City” from “village” status by the State of Ohio. 2. Police Chief Homer Davis organizes the first Medina Police Auxiliary in March, 1951. 1. Davis was a Graduate of FBI National Academy and his diploma was presented by President Dwight Eisenhower. 2. Davis was a bailiff in Medina Municipal Court from 1956 to 1968. Homer C. Davis died in 1986. 3. In 1947, the mileage traveled by the police cruiser was 32,046 miles. 4. In 1965, the police cruisers covered 95,164 miles. These increases, however, have been only in keeping pace with the growth of the city. 5. From 1950 to 1965 the budget of the police department has increased from $31,000 to $95,464. 6. 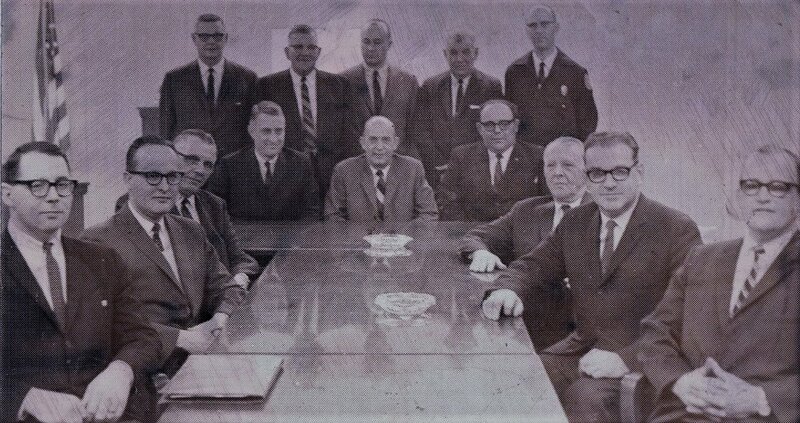 In 1966, the police department has a staff of eighteen people, composed of fourteen officers and four clerks. 1. 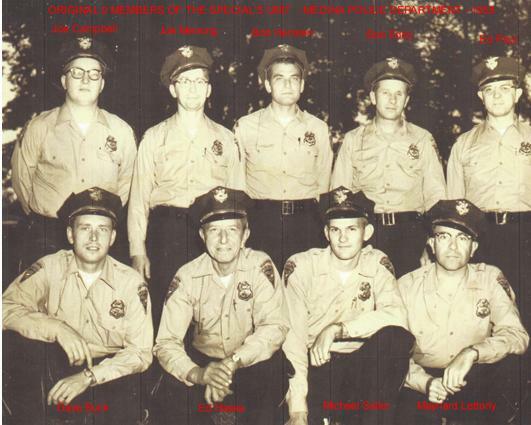 I started working for the City of Medina as a patrolman March 1, 1948, at which time there was one acting chief and two patrolmen, two patrolmen having just quit. The police department had one car and one motorcycle. Rudolph Blateric and I were hired to replace the two patrolmen who had quit in February. 2. I was appointed acting chief May 23, 1949, by Mayor Lauren F. Wainwright. I received a permanent appointment as Chief of Police of the village of Medina on November 2, 1949, Medina remaining a village until 1950. The salary at this time was $265 per month; the patrolmen were getting $220 per month. 3. 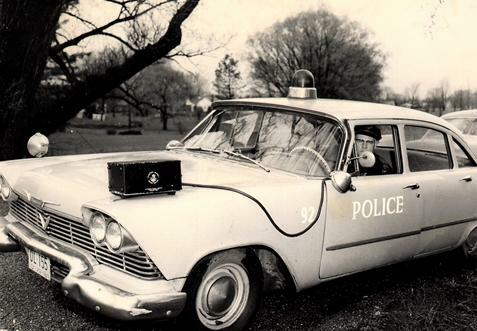 In the year 1950, the budget for the police department was $31,010. The population count that year was 5085, which automatically made Medina a city. I requested that the council sell the motorcycle and buy another police car, which they did. The police department consisted of one big room with two jail cells and one desk. I set up a system of records, which had not been done previously. 4. I worked closely with city council, county commissioners, and Sheriff Charles Williams and they were able to work out a plan to buy together a set of radio equipment for all patrol cars and the station. The city also hired a desk man to operate the radio system on the night shift; this was done in March 1950. 5. In February 1951, the city built an addition on the back of the police station, which was 6 by 22 feet, to house the jail cells. They also hired one new patrolman in 1950 and another in 1951. In 1952 we purchased our first radar unit. The men on the department went together and bought a camera and darkroom equipment. We also purchased a small model traffic light and a small lie detector unit. 6. During these years the men on the department had attended all the short courses conducted by the FBI in this area. From March 15-26, 1954, I attended the Ohio Police Administrator's School in Columbus, which was conducted by Ohio Sheriffs and State Patrolmen, and graduated in a class of 34 men. 7. In 1953, I asked for one lieutenant and one sergeant, consequently they were appointed. In 1950 1 had organized an auxiliary police unit, but I could only use them in case of an emergency. So in 1958 I organized a special police unit patterned after the Painesville Unit, which was the only one in the State of Ohio at that time. These fellows donated all of their time to the City of Medina, and there have been many of these dedicated men. They are certainly doing a wonderful job of volunteer work. Each man is dressed the same as a regular patrolman, with the exception of the Special identification patch on their shoulders. 8. In 1952, I asked for personnel to operate the radio desk on a 24-hour basis; three girls were hired at this time. I also asked for an alcohol-testing unit made by LaMott, which was purchased. 9. I was honored by an appointment to the FBI National Academy in Washington D.C. This is the top law enforcement school in the nation, which had graduated 3,452 men, including the 60Ih session, in which I graduated on November 8, 1957. This class had the first son of former graduate, from the 25lh session. There were 92 men in my class who all completed the three months of day and night intensive training. The men are appointed to this school, one from each federal jurisdiction in the United States. President Dwight D. Eisenhower attended and presented me with my diploma. 10. 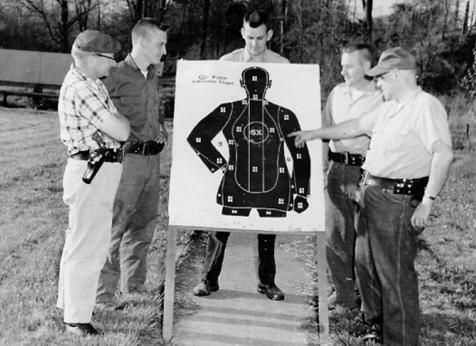 In 1957, we built our first police range for target practice, with no cost to the City of Medina. It was also in 1957 that I was appointed bailiff of the newly created Municipal Court for the City of Medina; this position I held until 1968, delivering all the papers for the court throughout the county on my own time. 11. I asked for an Alco meter alcohol-testing unit, which was bought in 1957. 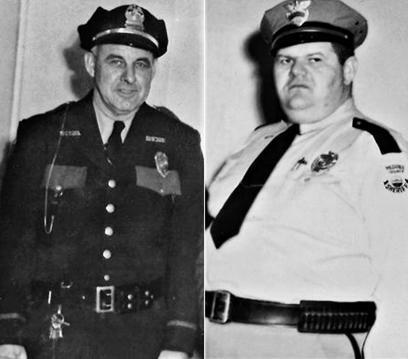 In 1958, 1 made a plea for another patrolman; one was added at that time, another in 1961, and still another in 1964. All were needed, of course, in relation to the growth of the city, which is still progressing. In June of 1959, 1 asked that another man be promoted to the rank of Sergeant, which the council did at that time. 12. In 1951, my office was so small that when I got a regular sized desk, I had to saw the center out of it to get it into the room. My office was also being used as a dark room and a meter repair room. The city offices were moved over to Elmwood Street in 1962, consequently the police department was given the vacant space over the Fire Station. The room we had formally occupied behind the Fire Station was taken over by the Fire Department. 13. We had plenty of room at this time, in the new quarters. We added an officer's room, a radio room, and a locker room, as well as a larger chief’s office. All the remodeling was done by the men on the department. We added another Sergeant, and increased our system of files. We increased our fingerprinting equipment also, and got a Breathalyzer to test for alcohol content. 14. Along with the Medina County Sheriff’s Department, we have started a school, which I hope to be able to train all of the new men from now on. I have sent all my new man to training schools, whenever it was possible to release them from a regular shift, which is sometimes quite difficult to manage. Most have appreciated the advantages gained in knowledge in specific fields. 15. We have established an adequate range program to school our men in the use and care of weapons, where they also have the opportunity to practice. At the present time we have three well-equipped police cars, plus one unmarked car for the use of the Detective we now have in plain clothes. It is with a great deal of satisfaction that I review the growth of this City Police Department, which had such a humble beginning. I foresee new growth of personnel and department space as finances permit, by present and future mayors and councilmen. I feel proud remembering all the wonderful cooperation I have received over the years from a total of seven mayors and thirty-one councilmen. Left to right: Ronald Hall, George Rodgers, Steve Petrigala, Glen Hattery, John Root, Art Roepke, Fred Greenwood, Jack Kinney, Homer Davis, Sr., Robert Jones, Thurston Berry, Harold Rogers, Dale Sigafoos, Harry Van Horsten. 16. 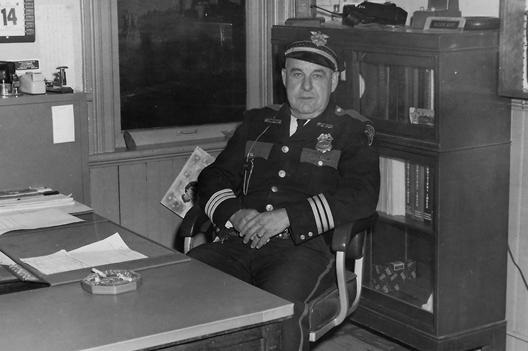 Chief of Police Homer C. Davis Sr. retired in 1968 and died in 1986. In April of 1974 the Medina Police Department moved into their new Police Department Offices and Jail Building at 150 West Friendship Street and still occupies it presently. Two of Medina's respected "gun-toting'" citizens of a generation ago are shown here posed in front of the town hall. Charlie Wightman and Ben Wells are doing the "toting'" and they are out for no less a reason than to do justice to the great number of crows that once plagued Medina. Therefore, know all men by these presents that we do challenge B. L. Wells, surreptitious crow dealer, and his aggregation of— blunder-buss firers and crow-mlssers to an honest crow hunt on the afternoon of April 20. A. D. 1899 yours for an honest ballot and fair count; G. F. High, Crow Captain, et al. In the left background of the picture can be seen the old Bishop carriage works which has since been replaced by I the Princess Theatre Block. Along the east side of the square may be seen the court house as it is today, the Seymour home, which was then the Hayes' and the Young home which was removed away from the square. New Gazette Block built in 1896 replaced a small frame building that was next to the firehouse, in 1895. In the basement is also located the gasoline engine which furnishes the motive power for operating the presses and folding machine. A large Fireman steam heating boiler is at the end of the basement which supplies steam to the radiators throughout the building, heating every room. In the basement is a Cleveland gas machine which generates gas for ample lighting the building throughout. In the basement is also located the force pump which is connected to a cistern outside, and which supplies a tank in the attic from which the upper and lower floors are supplied by a system of pipes for hot and cold water; the hot water being supplied from the boiler in the basement. 1. The Constitutionalist and Whig Newspapers merged in 1841. 1. The Medina Gazette commences the New Year with the adoption of the advance pay system and the uniform price of $1.50 per year in advance. 1. The front room on the ground floor is occupied by George. F. High, a leading jeweler, who has fitted the room with fine fixtures and carries a fine line of goods. 2. George F. High apprentice to A. I. Root bought the jewelry business of A. I. Root in 1878 and operated it here until 1900, when he moved to #215 South Court Street to share a building with J. Tuttle Drug Store. In 1835, forty-two years ago, a Whig newspaper called The Constitutionalist was started in Medina by J. S. Carpenter. Under that and many other titles and controlled by a long line of publishers and editors, the political character, business, good-will and material of the office was handed down from year to year until the present. The Gazette is therefore entering upon its forty-second year, instead of the thirty-fourth as the number of the volume heretofore indicated. We have examined the genealogy of the paper by the aid of authentic history and find that it is the lineal descendant of The Constitutionalist of 1835. In preparing biographical sketch of the newspapers of Medina village for the now County Atlas we had occasion to examine the earliest files of not only all the Whig, but of all the Democratic papers ever published in the county; also had correspondence with Judge Carpenter of Akron; John Spoor of Kansas; Redway Brothers and all others who had ever been engaged in the newspaper business here. That sketch, as published in the Atlas is therefore historically accurate. From the first issue of The Constitutionalist to the present time this paper has been published regularly every week, with the exception of a suspension of a few weeks in 1848, when the office was destroyed by fire; and again in 1870, when the office was again destroyed by fire, other journals of the same political faith were at different periods started in opposition, but they either died for lack of support or were consolidated with this. Thus, in 1837, a Whig paper was started by J. Lowry, which was published until 1842 when the, two papers wore consolidated under the name of The Whig and Constitutionalist. In 1843, the name was shortened to The Democratic Whig and in 1853, it was changed to The Gazette. In 1868, an opposition Republican paper was started called The Republican, which after a brief life of eight or nine months, was consolidated with the Gazette. The list of those who have been connected with the paper, as editors or publishers, numbers many of the public men of this and neighboring counties, namely Judge Carpenter and Judge McClure; J. Lowry, Walter P. Jayne, William. H. Canfield, Pardee and King; Speer and Bennett and John Speer; Hon. H. G. Blake, Hon. Francis D. Kimball, Judge Charles Castle, Col. H. Canfield; Kirkland and Redway, R. E. and George Redway; John Weeks, M. B. McCabe, R W. Clark, and Dr. J. N. Robinson. The Gazette has witnessed the birth and death of several Democratic contemporaries—one in 1844; another in 1854; another in 1861; and another in 1875. The first paper ever published in the County was an Anti- Masonic journal, called "The Ohio Free Press and Medina County Advocate" by Joseph W. White, 1832 its office was destroyed by fire in 1837 and the pa per was never revived. Thus the lifetime of the Gazette covers that portion of the history of the town and county during which they have reached their present condition of prosperity and importance. In the future, as in the past, it will be an important and indispensable factor not only in promoting the material growth of the community, but in diffusing sound political doctrine, cultivating neighborly amenities and courtesies, and helping to make life pleasanter and better generally. All for §2.00 a year, invariably in advance. Now is a good time to subscribe. 1. 1888 - "The Medina News office was destroyed by fire Feb. 14. Mr. Gray estimates his loss from $5,000 to $7,000, and was insured for $3,000." 2. "The Medina News has been consolidated with the Gazette and hereafter the paper will be known as the Medina County Gazette and News." 3. "Charles D. Neil has purchased the interest of the late Mr. Green in the Gazette office and assumed the entire and sole management. Aug. 1, 1888." 1. In 1899, Mrs. Nellis S. Neil, publisher of the Gazette, sold the building and lot #36 to Fidelia E. and brother George Brown of Weymouth for $7000. and on the Board of Education: Dr. A. P. Nichols, James Newton; and N. P. Nichols, while W. E. Griesinger, George F. High. J. A Hobart, Lyman Oatman, E. R, Root and P. N. Yoder were councilmen. Episcopal, Rev. W. J. Hawthorne; and Rev. E, C. Davis at the Church of Christ Disciple. Thirteen lawyers were named, only one of whom is now living, N, H. McClure. M. D. Kimmel, J. E. Levet and G. W. Reinhardt had bakeries and confectionery stores. D. D. Braden, J. V. Schmittel and H. E. Schuler were the barbers. There were four blacksmith; A. B. Benford, J. Holbein, T. Huddleston and Elmer Huffman. Griesinger and Yoder Bros. sold the shoes. O. N. Leach, Nichols and Ferriman and J. F. Styer clothed the town. J. P. Miller and J. S. Warner furnished coal. G.D. Billings and A P. Nichols looked after the dental requirements. W. H. Albro, D. C. Bradway and McDowell Bros, had drug stores. Dry goods were handled by F. E. Edwards and Co., J. P. Miller, The Phoenix Store (W. E. Hemmeter and George Boult), and C. L. Warner and Company. Furniture and undertaking; Addis V. Asire, John Barrow, R. M. Barnum, and Fred M. Branch. Of the eight grocers only one is now still is business; C. M. Cannon, and others were John Canavan, G. W. Chipps, C. B. Hoard, Hobart and Sons, James Newton, J. B. Wideman and Whipple and Sipher. Hardware was sold by W. H. Hobart, Albert Munson and Son and Oatman Bros.
John E. Renz and Son and R. R. Rettig manufactured harness. Hotels were the American House, Germania House and the Union House Hotel. Jewelers were George. F. High. H. H. Brainard and J. Andrews. J. A. Spafford managed the Medina Steam Laundry. W. C. Arick, R. C. and N. M- Fenn and George E. Warren conducted livery stables. W. B. McKenney and B. H. Wood & Company had planing mills. Carl Engel managed the Medina Foundry Company out near the fairgrounds on the C. L. & W., and George E. Webber and Company had the present foundry where the Henry Furnace & Foundry Company is located. The Durand Mfg. Company made coal oil stoves. There was the Ablm & Edwards Electric Co., The A. I. Root Company and the Medina Bending Work. Hemmeter & Adams conducted the marble works. Two merchant tailors were Ozro Sanders and John Steeb and Son. Feed mills were the O. C. Shepard Co, and J, P. Miller. Five milliners furnished hats for the ladies, Mrs. A. J. Blackford, Mrs. O. M. Jackson, Mrs. Somers, Mrs. C. W. Warren, and Bell Washburn. Paper stores and hangers were D. L. Harden, Gray and Ross, and Edward D. Lowe. Mrs. Minnie Baldwin taught music and M D. Kimmel sold pianos and organs. William A. Baldwin made portraits and T. D. Brown and F.L. Hawkins had photograph studios. W. B. Croft, G. J. Damon, C. D. Freeman, E. G. Hard, S. Hudson, F. 8. Jones and L. S. Murray were physicians. W. H. Winch had a restaurant. Out of all these names we can find but 20 that are now living. Forty years surely sees many changes in the personnel of a town. 1. The Elyria Chronicle purchased the Medina Gazette in 1964. 2. Gazette merged with the Daily Leader Post in 1964. 1. The Gazette moved to a new building at 885 Norwalk Road near City limits in 1969. The second story of the Neil building is arranged into very convenient offices, of which the two front offices are occupied by the Commercial Club, which they have fitted up in a very nice manner, keeping them open day and evening to members, of which there are about forty, who are prominent business men. A Frame House prior to building of the Neel Block in 1896. Gazette moved campaign HQ to room 3 in 1933. 1. Miss Della Hartman, instructor on the piano, occupies a suite, for a studio on the second floor. The small frame building was attached to the Gazette building just east of Gazette was moved. The rear part of the building having stood since 1830 and having survived two fires. In 1854 it was the law office of F. D. Kimball and Herman Canfield dba as Canfield and Kimball. Front of building had alterations in recent years and has been a cooper shop, shoe store, doctor’s office and various mercantile shops. 1. Herman was the attorney, clerk of courts and state senator 1855-1859. He died in Civil War at Pittsburgh Landing, TN in 1862. 2. Francis D. Kimball In 1842 moved to Medina County, Ohio, and was soon elected to county office. He was prosecuting attorney of Medina County 1849-1853. He was Ohio Attorney General in 1856. 1. Canfield and Ladd opened a bank in 1854, only bank in town in 1857. 2. Edward Fenton Ladd died Dec 4, 1854 in Medina. 3. Mr. L. W. Ladd at the bank has pure cane sugar seeds for sale 1858. 1. Edward Cohen and wife lived in the rear of the building. 1. In 1878 Edward Bostwick a carpenter came out of Bissell and Cohan’s Barbershop at 11 pm and fell into the foundation hole of the new engine house and broke his arm. 1. Hitching posts installed in1895. 1. Manufacturers of W. H. Harvey’s chemical fertilizers, patented tree and plant fertilizer and insect destroyer. Lot facing Public Square next to Neil Building to Frank L. Harding in 1903. 1. Frank L .Harding sold to the Canfield building for $1600.to George and Fidelia Brown of Weymouth, owners of Neil Bldg., and they will fix up the Canfield Building on the lot and rent it in 1903. 1. Firm sells electric supplies and fixtures. 1. Provides electric cleaners and operator for 50c per hour, electric cleaner rental 1.25 per day, water motor attached to water faucet for $65. 1. Owner, Henry Howe razed or moved the original building in 1910 to make room for new frame building built for Dr. Robinson. 1. Dr. William Abner Nichols bought building for dentistry from H. G. Rowe in 1914. 1. Dr Stanbery J. Nichols, son of Will Nichols began dentistry in 1936. 2. Dr. Stanbery Nichols closed this office and moved to a new office at 243 South Broadway Street in 1963. 1. The McManus Agency is committed to delivering the highest level of service and professional risk management guidance to our clients. As a Trusted Choice independent agency, we are dedicated in offering custom insurance products, competitive options, and truly professional insurance advocacy for our clientele. Whether its commercial insurance, comprehensive personal insurance programs, or specialty coverage, The McManus Agency has the expertise to help you move forward confidently. 1. In 1871, Samuel H. Bradley's new house was built by Hickox and Sons. Samuel H. Bradley built a new barn south of town hall in 1880 near the Samuel H. Bradley’s home on the corner. In 1904 Samuel H. Bradley sold his home and lot to C. J. Warner for $1700. In 1905. Dr. C. D. Freeman bought the Samuel H. Bradley (merchant) house for $3,500 on the southeast corner of the Public Square at Washington and Broadway Streets. 1. Dr. Freeman owned the property in 1922. In 1928 Dr. Freeman was offered $25,000 for this property by Standard Oil Company in 1925, with an appraised value of $10,000. 2. Dr. C. D. Freeman graduated from Cornell and OSU, practiced in Medina from 1884 to 1897 in the same office on the West-side of Public Square; Dr. Freeman was County Coroner from 1890 to 1897. 1. In 1928 Dr. Will Nichols bought it and moved the house to the south adjacent lot at 209 South Broadway Street. Today the house has been renovated into Law Offices. 2. George Mellert of Free Oil Company purchased the part-lot 37 property from Dr, Will Nichols in 1928 with plans to add a handsome gasoline and oil station, set back from East Washington and South Broadway Streets for a cost of $10,000-$12,000 in 1930. 1. George Mellert of Free Oil Company owned and leased to operators until 1979 when Ray Mellert sold the property to Bank-One Company. 1. Fred Hazen started working for the station in 1932 under Joe Taggart. 1. In 1933, Derwin Nettleton operates the J. D. Taggart Shell Oil service station at the southeast corner Public Square and in 1935 sells Hudson and Terraplane automobiles there as well. 2. Nettleton Auto Service moved from the property in 1946. 1. J. D. Taggart sub-leased the gas station business to Fred Hazen in 1940, and was named Hazen Shell Oil Company in 1941. 1. Fred Hazen managed it from 1940-1943, then went into WWII service. The station was than operated by Joe Taggart. After his return from WWII service in 1946 Fred W. Hazen retook lease ownership of the Shell Gas station at the southeast corner of Public Square. 1. In 1948 the station was operated by Tom Hilberg’s family, Leo Johnston and his son Leo Jr., as a Free Oil Station through 1953. 1. Leo Johnston died in April 1953 and his wife and son operated the service station for one year. 1. In 1954, Carl Riley acquired the operation from the Johnston family and will manage the station renamed as Park Shell General Tire Service Station. 1. Free Oil Company Park Shell Station was leased to Chuck and John Mumaw in 1956. 1. Free Oil Company Park Shell Station was leased to Don Scheck in 1959. 1. Free Oil Company Park Shell Station was leased to Gus Letterly in 1963. 1. Free Oil Company changed supplier to American Oil Company in 1970. 1. Free Oil Company leased Amoco Station in 1976. 2. In 1979 Free Oil Company sold the Gas Station property to Bank-One Company. 1. In 1980, the Amoco Station was demolished and construction was begun on the 3 story Bank-One building. 2nd and 3rd Floor Occupants from 1985-2010 and 1st, 2nd, and 3rd Floor Occupants after the close of Bank-One in 2010. 1. Gorsek and Sibits moved to North Elmwood Street in 1988. 1. McManus moved his offices next door to 56 East Washington Street in 2013.